Metalized polypropylene film capacitor / cylindrical / power - ENTES Elektronik Cihazlar İmalat ve Ticaret A.Ş. Electricity - Electronics - Optics > Electronic Component > Cylindrical capacitor > ENTES Elektronik Cihazlar İmalat ve Ticaret A.Ş. Stand: ENTES Elektronik Cihazlar İmalat ve Ticaret A.Ş. LV Power Capacitor enables to connect and disconnect up to 100 times a day in following load variation in automatic reactive power compensation system really speaks for endurance, quality and capacitors. It also balance inductive reactive loads on a system. In a connection/disconnection instances, the current with the higher value may occur on reactive power compensation capacitors. 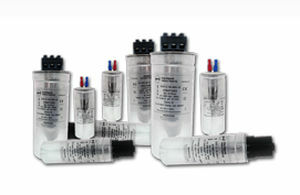 Latest technology in safety is adapted in ENTES ENT.C series capacitors. Thanks to the overpressure disconnection system, the explosion of capacitors due to an electrical/thermal overload or being the end of its operating life is prevented.